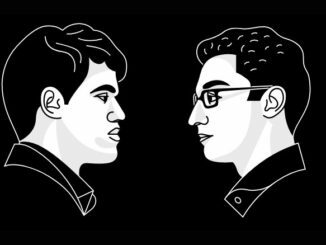 HomeWorld Chess ChampionshipCarlsen vs Caruana 2018World Chess Championship 2018: Game Five Drawn as Caruana’s 1.e4 Misses The Mark. World Chess Championship 2018 taking place in London, United Kingdom, between November 8th and 28th. In Round five, it is the Challenger's turn to misfire, causing the Champion no problems with 1.e4. 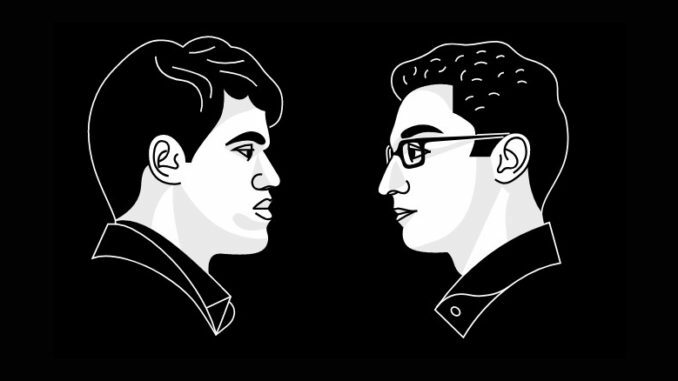 The FIDE World Chess Championship, resumed on Thursday 15th November, with game five. During Wednesday’s rest day, Magnus Carlsen had played football with his team, Fabiano Caruana had I believe done yoga, and all hell had broken loose down the road at the heart of the British government. It is not like me to make too many predictions, but I think it is very likely, that any guests lined up from British politics, might be otherwise engaged for the time being. And, if the British Prime Minister was due for any round (well, you never know) then it is anyone’s guess as to who that might turn out to be. 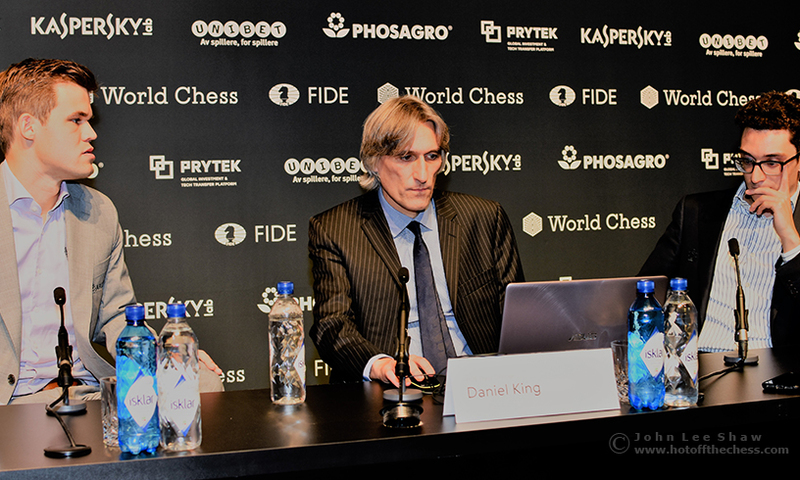 Today, the guest of honour was Jimmy Wales, the founder of Wikipedia, who was tasked to play Fabiano Caruana’s first move. Thankfully for the American, who has had a testing couple of days, there was no mishap. There was also perhaps no surprise either, with 1.e4. This saw yet another Sicilian Defence, that produced yet another draw. Fabiano’s 6.b4 seemed quite aggressive, but as Grandmaster Ian Rogers pointed out, this had already been covered in literature and Carlsen followed the recommended line and was fine. Indeed, the World Champion said that today was not the first time that he had seen this move. The opening line in Game 5 of the World Ch. was covered in the 1984 Batsford book ‘The Anti-Sicilian 3.Bb5’ by Razuvayev and Matsukevich, considering Black’s position satisfactory after 11…Ne7. 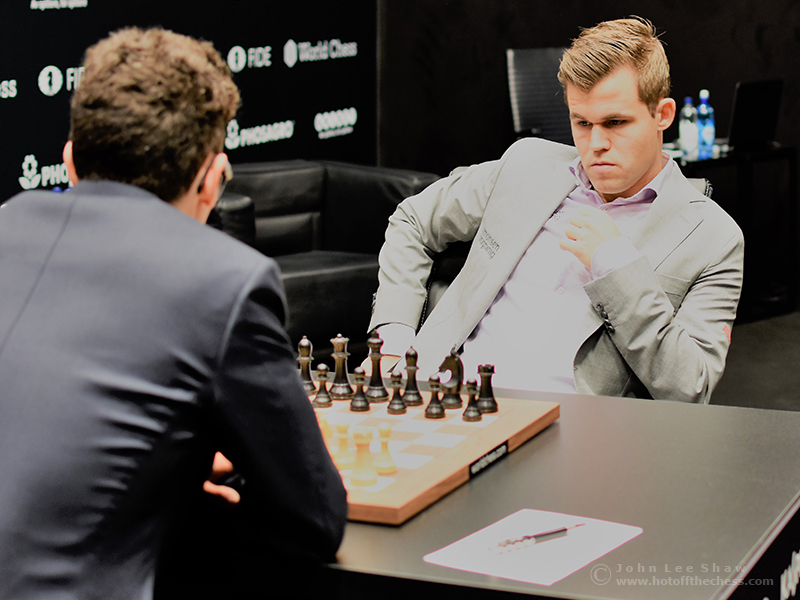 You will remember the previous round of course, when Magnus Carlsen didn’t manage to get anything from his White game and posed Fabiano no problems. In all honesty, this game strikes me as a bit of a returned favour from the American. It was his turn to have a bit of a dud. In the press conference, I asked Fabiano, if he was disappointed and felt that he had missed a chance to strike at Magnus, who will now have two white games on the spin. Fabiano told me no, basically. But he must be. A win today would have put a lot more pressure on Magnus Carlsen’s back-to-back white games — and more frustration were he to fail to do anything with them. 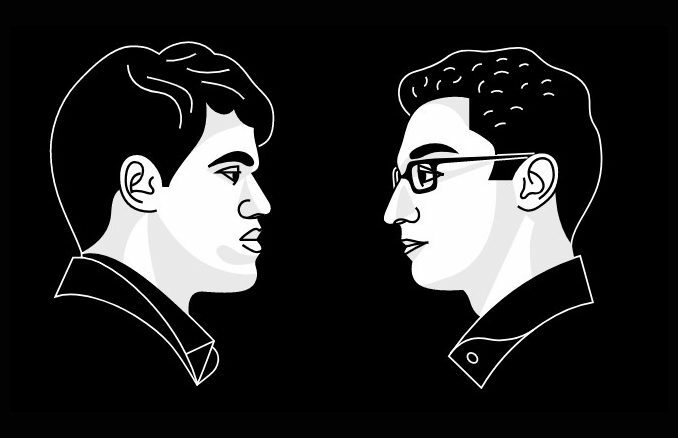 As we know, Magnus Carlsen and frustration do not mix well. So far, the draws do not seem to be miffing the World Champion too much. I think that he has learned a lot from his 2016 match against Sergey Karjakin, which saw seven in a row. As someone remarked in the press room today, we are getting close to repeating that, but we’re not quite there yet. So far, Magnus is in very good spirits and seems to be quite composed. Infact, that is understating things slightly, it is the Norwegian who is providing all the laughs so far. He told me that he is happy with the way things are going with black and is looking forward to his two whites. With two rounds left up to the half way stage, we are reaching a bit of a crucial stage if either one of these players want to win this match outright and I still believe that both of them do. However, it remains the fact that if one wishes to see war, blood, hair flying, deadly plans and schemes, in London during this World Championship at the moment, Westminster is looking more of a certainty. And I never thought I’d ever be saying that! Before I hit publish on this latest offering, dear reader, I have a small announcement to make. That is, namely, that from this post onwards, I wont be annotating the games. My reason for this is that to do it properly just takes too much time and holds me up in publishing. It is also not really what I’m about. My forte is more about bringing you the experience of the tournament in my own unique way (such as it is) and getting into the psychology of it. I wish to thank my esteemed colleague, John Saunders, for helping me realise this. In his brilliant blog post detailing his visit to the tournament, John says that game analysis is already being done by sites such as Chess24 and Chess.com, and that, “…there would be no point in trying to compete with all these online chess outlets.”. This prompted me to reflect and to conclude that I completely agree. And so, from here on in, I will be leaving the detailed analysis of the games to the afore-mentioned sites and restricting my comments on the games to diagrams if/when needed. The focus of my blogs will be on bringing you my personal account of the Championship and my perspective, interpretation, and analysis of human tournament play. I am hoping that you will find this agreeable!